Li Wenmin, born in China and now lives and works in Sydney, Li Wenmin obtained her BFA from Lu Xun Academy of Fine Arts in 1997. Her post-graduate studies were at College of Fine Arts, The University of New South Wales from 2001, graduating with a PhD in Drawing in 2009. Li’s research into the relationship between Chinese traditional art and contemporary drawing has been presented at conferences in Sydney, UK and China. Li Wenmin’s artwork has been exhibited in Australia and internationally including the UK, Japan, China and Hong Kong. 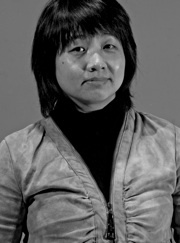 Li is currently a lecturer of Painting and Drawing in the School of Art at COFA. Since Tang and Song Dynasties (7th - 13th Centuries) Chinese families have maintained the tradition of decorating their homes on New Year's Eve with some woodblock printed pictures on paper, commonly called Nian hua. Since the resurgence of this traditional art form in the 80's, Nian hua has drawn the interest from some contemporary Chinese artists who have sought the connection between the tradition and the contemporary, an issue of heritage and creation in art. Therefore this paper, from a practitioner's perspective, will investigate three artists in their use of subject matter of Nian hua to discuss the relationship between Nian hua and contemporary art. These three artists search for various interpretations of use of subjects in Nian hua, one of which is to re-contextualise traditional images in contemporary living environment. The Luo Brothers' have created 'kitsch' representations of Western consumer products and pop-culture icons in contemporary life in China, with traditional images of Nian hua. It is a critique of China's acceptance of Capitalist consumerism and its influences on traditional life. Gu's series of Door God has raised the question of how Chinese contemporary art could possibly escape being labelled as Chinese solely on the basis of using Chinese themes. Using Door God as the only subject, Gu has deconstructed and reconstructed forms to explore the possibilities to create a dialogue between tradition and the contemporary. The subjects Li has chosen from daily life and the techniques applied have been inspired by traditional Nian hua. It is the intention to explore cultural and personal identity in a foreign living context, which has become an open process in which interaction and mutual influences between different cultures are important. Tracing tradition and interpreting it in contemporary art has led to a personal search for identity in everyday narrative.